Dani Sloan is pleased that her chef-to-go lunch service is starting to take off. Business really starts to pick up during Normalton University’s orientation week since students are a large part of her business. But then a murder and a series of carjackings occur that could mean trouble for Dani and her student helpers. One of these student’s uncles is the head of campus security and doesn’t want Dani to get involved. However, Dani’s natural curiosity and desire to help her friends gets her in deeper into the investigation and places her in real danger. 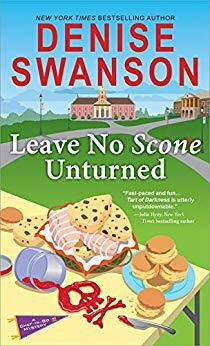 This book is the second in a new series by Denise Swanson. I missed the first book, but quickly caught up with the important characters. Dani has feelings for the campus security head Spencer Drake, but I also see a lot of chemistry between her and Detective Gray Christensen. I like the campus/college town setting of the book, too. For the most part, I like the main characters, although there is a lot of negativity towards relationships and marriage in the book. Somehow, in spite of that, there is a little romance between some of the characters. Dani’s student helpers aren’t that well-developed and unfortunately the least likable of the three, Tippi, plays the biggest role in the story. The plot gets a little convoluted, but I was interested to see what would happen in the story. The premise of the series is interesting enough that I would read follow-up books in the series. Some cozy series have too many recipes, even when there isn’t a culinary theme. This book on the other hand, where food plays such an important part of the story, could have used a few recipes for the dishes Dani prepares. Those who follow the author’s Scumble River series will recognize a couple of side characters from those books and will enjoy seeing them interacting with Dani. Those who read the first book in this series will like seeing what is new in Dani’s life and with her new business.